How to Choose an SMS Service Provider? A long-term and consistent SMS Service marketing strategy yields a positive impact for the company. Given the affordable cost of the SMS service provider and a huge market potential for any business niche, entrepreneurs often reap a higher ROI than other channels. However, much thought needs to be given for choosing SMS provider. In this article, we are going to share some tips to choose SMS Service provider. In the credit-based service, the buyer purchases a credit plan and based on the delivery country, creditsare deducted from the account. For instance, sending an SMS to Canada might cost 3 credits whereas an SMS to UAE might cost 1 credit. In the SMS based service, the buyer purchases a pre-defined amount of SMS messages, which again varies from the country of delivery. The cost of SMS to USA and UAE will differ. 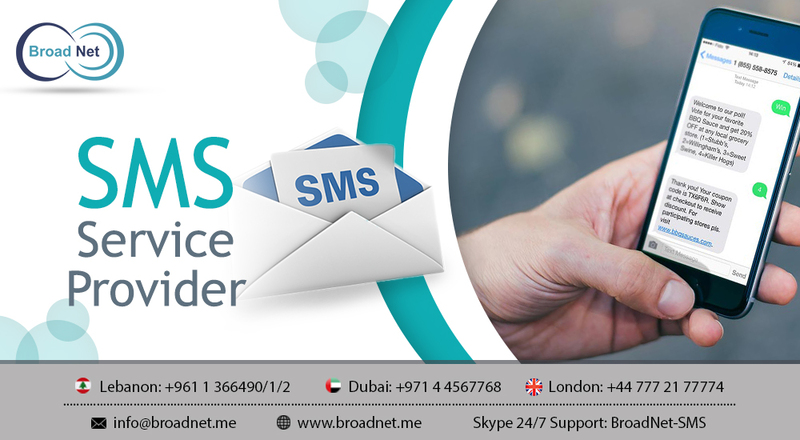 If you want to understand the different prices for SMS service provider, read the List Of Countries where BroadNet fulfills bulk SMS services. Broadnet offers a comprehensive bulk SMS service solution. It all boils down to the targeted countries and finding the best cost effective plan for delivering SMS to those countries. Buyers need to be aware of the hidden or additional costs. Sometimes an SMS Service Provider mentions the cheapest of the prices on the website just to interest a prospective buyer. But, when it reaches the checkout page, additional costs could reflect such as setup fees, multi-user access fees, or expensive SMS plans. While it is not wrong to charge for these, they should be mentioned clearly on the pricing page, so the buyer is aware of the final cost incurred. An SMS service provider is not useful for business if most of the SMS fails to reach the recipient. Of course, a lot depends on the accuracy of the buyer’s database but at the SMS service provider front; they should have a strong partnership with telecom networks to ensure the promotional or the transactional messages are delivered without any delay. Broadnet functions in over 140 countries and has partnership with over 400 network operators in all their listed countries. Due to this partnership, Broadnet can deliver Bulk SMS services at amazing price. Before choosing the SMS provider, talk to their sales representative and enquire about the delivery rates. They should show an active demo account. Ask for the detailed list of supported and unsupported countries. Cheapest SMS cost does not necessarily mean good service. Ensure to check the network quality always. Irrespective of whether the buyer opts for the basic package which usually has around 1000 SMS quota or the platinum/gold ones, it is necessary to ask about the package validity. Will the unused credits or SMS allowance be carried forward to the next month? If not, it would seem like a forced activity to finish all the quote in each month even when there is no such requirement. Small business owners with limited budget and experience should always choose to test marketing platforms before committing a larger budget. Therefore, try to explore a flexible plan where the buyer has the pay-as-you-go option. A well-documented API is necessary for the overall functioning of the system. As the business owner, being technologically challenged should not deter from hiring the best SMS service provider. Consult with a developer. Why? Checking out the API documentation will help to understand whether the SMS provider supports concatenated SMS messages; if it does, the code should have the proper parameters and commands. A concatenated SMS is the process where a long SMS message is split into smaller parts as individual SMS and recombined on the handset of the recipient. Either ask the SMS Service provider directly or check out the SMS API whether such a feature is possible or not. Apart from these basic five tips, check out whether the service provider has other features and benefits such as tracking SMS campaign engagement, customized dashboard, short URL creation tools, automated SMS for inbound and more. Irrespective of whatever is advertised, it makes sense to sign up with an SMS service provider and test out their system before on boarding all the Bulk SMS Marketing activities. BroadNet will help you to become one of the Best SMS Service Provider in Market.